The United States will soon present a timeline to North Korea with "specific asks" of Pyongyang after a historic summit between U.S. President Donald Trump and North Korean leader Kim Jong Un, a senior U.S. defense official said. The official, who spoke to a small group of reporters ahead of a trip to Asia this week by Defense Secretary Jim Mattis, did not specify details but suggested that the timeline would be rapid enough to make clear Pyongyang's level of commitment. "We'll know pretty soon if they're going to operate in good faith or not," the official said, speaking on condition of anonymity. "There will be specific asks and there will be a specific timeline when we present the North Koreans with our concept of what implementation of the summit agreement looks like." Secretary of State Mike Pompeo said last week he would likely travel back to North Korea "before too terribly long" to try to flesh out the summit commitments. 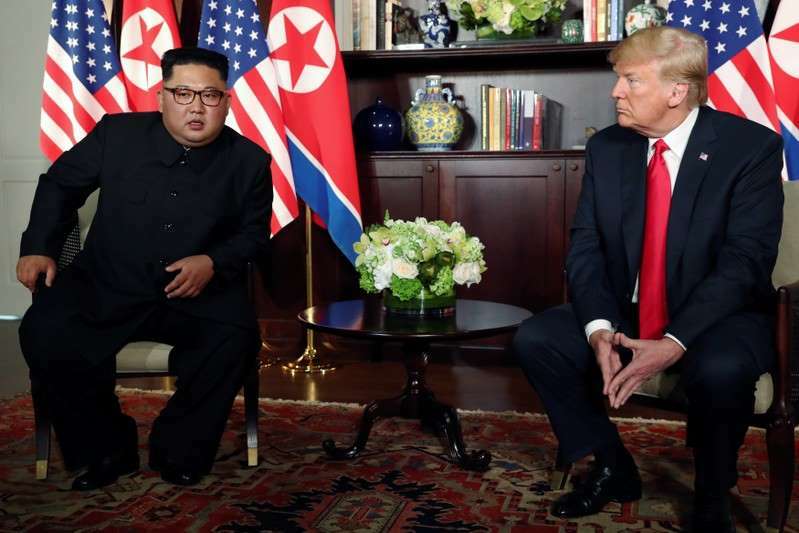 At the Singapore summit, the first meeting between a serving U.S. president and a North Korean leader, Kim reaffirmed a commitment to work toward complete denuclearization of the Korean peninsula, while Trump said he would halt joint U.S.-South Korean "war games." Mattis, at the start of a week-long trip that includes stops in China, South Korea and Japan, said Trump's guidance on suspending military drills applied not just to the major Freedom Guardian exercise in August but also to two smaller Korean Marine Exchange Program training exercises. "The large, joint, combined exercises have been suspended. ... We'll see if the continuing negotiations keep them that way," Mattis said, adding that he was in frequent contact with Pompeo. His trip there from June 26-28 will be the first by a U.S. defense secretary since 2014, and comes as Sino-U.S. tensions have heightened over trade and China's muscular military posture in the South China Sea. North Korea is expected to be among the top items on Mattis' agenda during his talks with senior Chinese officials. He will then travel to South Korea and end his trip with talks in Japan on June 29. Last week, China hosted North Korea's Kim. North Korean media said Chinese President Xi Jinping and Kim reached an understanding on the denuclearization of the Korean peninsula after discussing the outcome of the U.S.-North Korea summit.